After more than half a century of business, these are now the last days of Rossi’s Cafe in Hanbury St which closes forever on Friday. 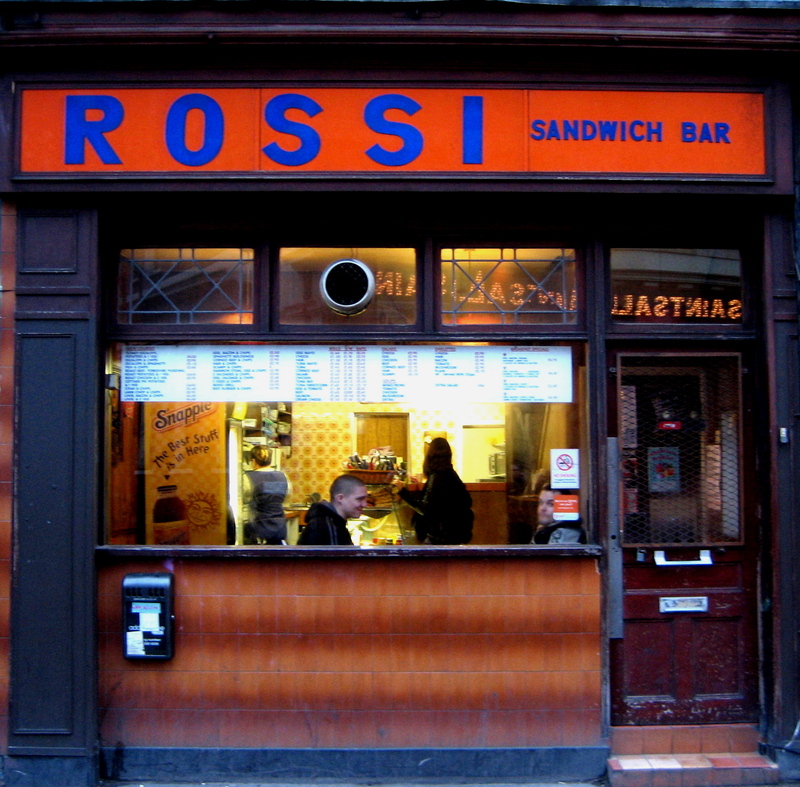 Opened by the Rossi family as an Italian cafe in the nineteen fifties and run by Johnny Rossi until his death nine years ago, this venerable Spitalfields institution has been upheld and thrived under the management of Harold and Jenny Londono from Colombia – who have become popular hosts in their own right, loyally serving the original clientele from the days of Mr Rossi. Opening six days a week at six in the morning, Rossi’s was a central meeting place in Spitalfields for more than a generation, held in affection by the stalwarts who came here for breakfast, lunch and a vivid social scene their whole lives. Luzangy, Harold’s daughter, kindly served me a cup of tea in the beautiful fifties interior of the cafe, as I sat enjoying the vaporous warmth. Harold joined me, explaining that since the landlord refused to renew the lease for the cafe and, after a petition and a court appeal failed, they have no choice but to close. It is understood that the property can be more profitably let as office space, now that Spitalfields has gone up in the world, but no office, however sympathetic, can replace the rich social milieu that Rossi’s supports. Then a friendly gentleman who has been coming through the door of Rossi’s Cafe for more than twenty years walked up to the table and into our conversation, desiring to make his voice heard. “Do you come here every day?” I ventured, “Unfortunately!” he replied with an ironic grimace. “And what do you have?” I enquired, “The full poison on a regular basis.” he reported gleefully, yet with a hint of elegy in his voice. “We know everyone, they’re lovely people, exceedingly friendly,” confided Harold to me later. 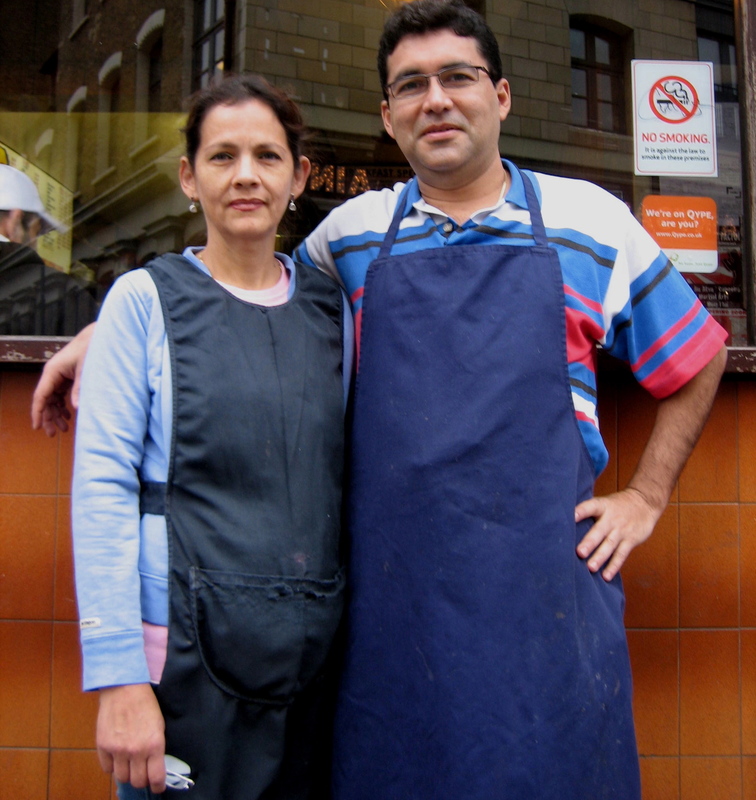 It is not so long ago that Rosa’s Cafe in Hanbury St, and The Market Cafe in Fournier St shut, places that once served the porters in the days of the fruit and vegetable market. When The Market Cafe closed, Gilbert & George started going to eat at Rossi’s twice every day, for breakfast at six thirty and lunch at eleven thirty. “If they are in town, they will be here,” confirmed Harold proudly. I raised my gaze to the familiar scene of diners hungrily tucking into cooked breakfasts before hurrying off to work, and old friends sipping tea and passing the time of day without any imperative of time. All embraced within the warmth of a traditional fifties cafe interior, lovingly kept and perfectly clean. Next week this scene will be gone and the daily performance will end. Where will Gilbert & George and all the other regulars go now? John and Jimmy (pictured below) have been coming here over forty years. This is an emotional moment for the staff and customers of Rossi’s Cafe, and rightly so because they are drinking tea on the edge of a cliff that is about to collapse and there is nothing anyone can do about it. “We are going to miss our customers, we are going to miss the place. We tried very hard to stay,” admitted Harold in reluctant acceptance. He gets up at quarter to five in the morning, six days a week, to drive here from his home in Pimlico to Spitalfields and open the cafe. If he goes to Smithfield Market to buy sausages, bacon and ham then he rises even earlier. Harold was never going to get rich running Rossi’s Cafe but it gave him and his family a modest living, provided a egalitarian space where everyone could afford to eat. Many in Spitalfields will feel the lack of it once it has gone and the long-established social network that attends it is lost forever. Pictured behind the counter today, here are all the staff of Rossi’s Cafe, Betty, Jenny, Harold, Fanny, Luzangy, Fabio and Jolio, putting a brave face on the situation as Jolio, the kitchen comedian, skylarks with a plate of cheese to lighten the moment. Harold and his wife Jenny occupy the centre of this photo, just as they have carried the family business, with the support of Harold’s sister Fanny (who stands in front him) and Harold and Jenny’s daughter Luzangy (standing next on the right), one of their two children who help out when not attending university. I was touched by Harold’s dignified self-effacing manner, now that the long fight to save the cafe is over. He and Jenny are already searching for new premises and I know they their customers will follow them if they can re-open elsewhere in the vicinity, so we must wish them well and hope to see them again soon. But in the meantime, we have two days to go round there and pack the place out, giving Harold and Jenny and their team a worthy send off in appreciation of the service they have given to Spitalfields. Oh, how sad. I hope they find a new place. The people look very friendly, good luck to them. It reminds me a little of The University Cafe in Glasgow on Byers Road, another local institution. Maybe you have visited it? Run by an old Italian family, it provides some great ice cream and a smashing bacon and egg roll. I think the place is nearly 100 years old now, and it still has the original decor. I do hope they find a new place to open. These places are our equivalent of eco-systems – without them where do we go to live? I have been coming to that cafe for a comparatively brief ten years but nonetheless will miss it. It served good food at a fair price, which is something practically non-existent elsewhere in Spitalfields. Why does this have to be the end? I understand that the Rossi Family still own the building and need the extra money. Isn’t there one person in all Shoreditch with too much money who wants to stop this place from closing? Someone who is prepared to put up the cash to save something worth keeping? This place could continue under the Londono’s for another fifty years. Gilbert & George – you are the obvious candidates… can you not sell a painting to save this wonderful place? Please. It is indeed a great place. The sad fact is that the new visitors to Spitalfields would rather visit faked versions of traditional cafes that serve the same ‘soul’ food at twice the price – indeed there’s one such place almost next to Rossi’s. I don’t mean to sound so bitter, but there’s some emperor’s new clothes going round Spitalfields that lead to bad things like this. I’m very sorry to hear Rossi’s is closing as it’s the only place that serves a decent bacon buttie and full English (without all the fuss and fancy packaging). I’m really pleased to see the modifications of Spitalfields, but do believe there are a few good gems that should remain and Rossi’s being one of them. How sad to read of the closure of this cafe. I try not to frequent all the super /shiny cafe bars, coffee houses that are replacing such as Rossi’s as the prices are unreal and not good value . I can’t bear to drink out of those huge buckets they seem to want to serve coffee in, dreadful. Hopefully Rossi’s can continue in the area and find somewhere soon. Come on! Wieden and Kennedy Save them!! oh no, i am sad. i lived in hanbury street for a couple of years. they were great, rosa’s too and that’s gone as well. support your small local business as much as you can! I am devastated. Only the Golden Heart shutting would be more shocking. Very sad………….my dad was a greengrocer and used to go to the market through the fifties ,sixties , seventies and eighties. 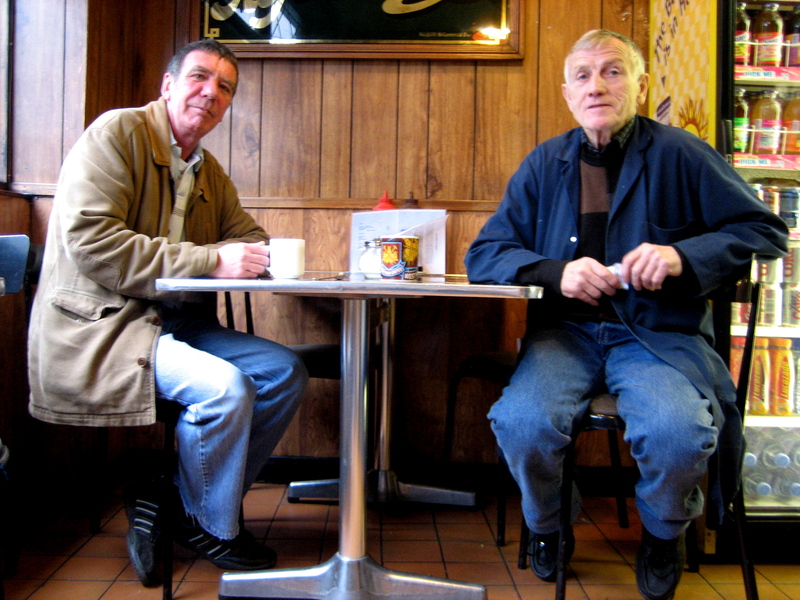 Myself and my brother used to come with him sometimes and he used to treat us to a big breakfast here…..I remember John the original owner.. I miss this place, me and my friend James used to have breakfast here, it was always a winner. The disney fish & chip shop that has replaced it just feels a bit soulless . What a tragedy that this iconic cafe closed I used it for 15 years when I worked in Truman’s my Dad for over 30 years, I well remember the Rossi family lovely people. I Moved out years ago to Kent, but on a slightly different note I would love to know how and when the market cafe closed. I can remember walking down the stairs where Clyde would be surrounded by great joints of meat and you could take your pick George and Gilbert were also regulars. I cannot for the life of me remember the name of the lady who served and took orders.. was it Dilys by any chance?